Have I mentioned I enjoy making biscuits and fried chicken? Because I enjoy making biscuits and fried chicken. 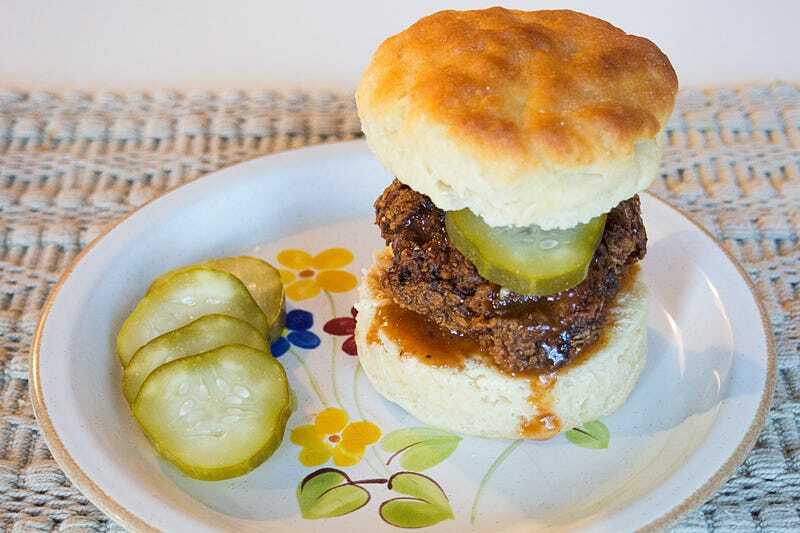 Here’s my chef’d-up version of a Chick-fil-A chicken biscuit. It’s all from scratch except the pickles. I bought the pickles, but they’re fancy pickles. The buttermilk biscuits are made from scratch, based on Alton Brown’s southern biscuits recipe but with a couple tweaks of my own. They are flaky and buttery and probably a little too tall for making a sandwich but hey I like tall biscuits. I fried the chicken (hippie-friendly free range organic boneless skinless thighs—no hippies were harmed in their production, only chickens) by first brining it in a mix of buttermilk and Crystal hot sauce, then breading it with a flour/panko/seasoning mix. Seasonings include salt & pepper, garlic powder, coriander, cayenne pepper, and Old Bay, because I’m from Maryland and I’m addicted to Old Bay. The sweet-n-spicy sauce is hoisin sauce, Crystal hot sauce, dijon mustard and agave nectar. The pickles are Ba-Tampte garlic dills, sliced. Ba-Tampte pickles are real Jewish deli style pickles fermented in brine, no vinegar needed. Take it from this here Jew who happens to enjoy making southern food, Ba-Tampte pickles are damn fine pickles. Both in general, and on chicken biscuits.